Al Falah University today organized a workshop in collaboration with Elsevier Inc. for its faculty members on how to use SCOPUS – a research database for the purpose of introducing various research mechanisms and publishing of academic articles in scholarly journals. The Scopus is one of the most important and the largest data base around the world because they contain the most important scientific journals and books in addition to the research output in the world in the fields of science, technology, medicine, social sciences and arts and humanities. 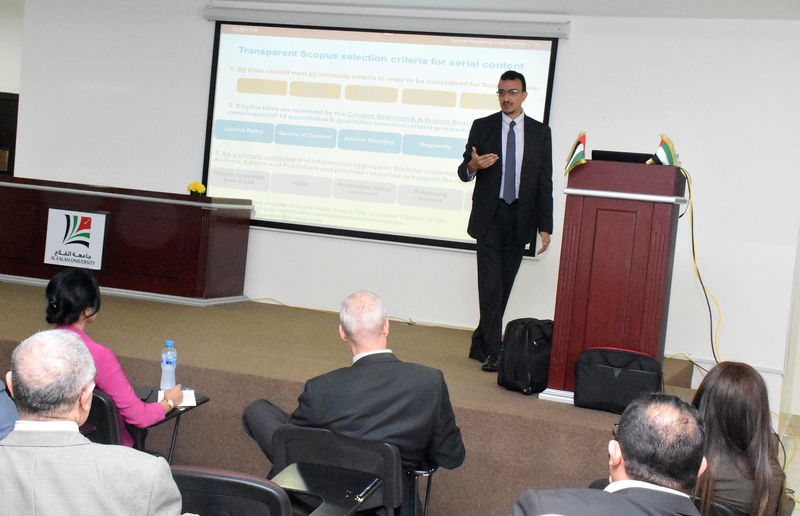 The presentation catered to introduction to SCOPUS in the beginning and further elaborated on its database to learn the principle of its use and its importance for academic institutions in general and the Al Falah University in particular. The representative of Elsevier Inc. Mr. Wael Mansour walked the members through the features of the software addressing the steps involved in the process of research and publication.He introduced the various modes of research incorporated to complete the process of publications and scientific research in scientific journals and books issued by the worldwide data.